“Dusty” was the ace left-hander of the Red Sox pitching staff from 1948 to 1953 when a sore elbow began slowing him down. He used his great fastball and a self-taught slider to go 109-56 during those six seasons, winning 20 games twice and throwing 20 shutouts. While Fenway’s Green Monster destroyed the careers of many Boston lefties, Parnell thrived in Boston’s home park. Only Roger Clemens and Cy Young won more games in a Red Sox uniform. 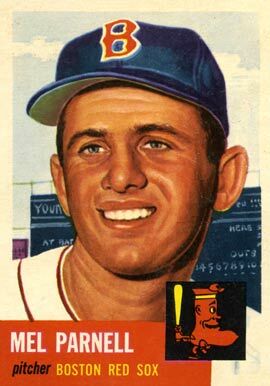 He retired after the 1956 season. Longtime Red Sox fans can remember “Marvelous Mel” broadcasting Boston games during the team’s miraculous drive to the 1967 World Series. Parnell was born in New Orleans on this date in 1922.